1. Place the mushrooms, chick peas, cumin, 1 tbsp oil and seasoning in a food processor and blend to a coarse paste. Divide into 12 and roll into balls. 2. Heat the remaining oil in a large frying pan and fry the falafels for 5 minutes, turning once, until golden. 3. 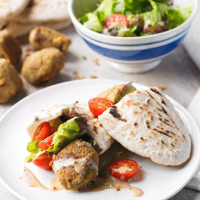 Toss together the salad, tomatoes and dressing and serve with the falafels and sliced toasted pittas.